Excessive dietary sodium is a significant health issue. MayoClinic.com states that most Americans consume twice the salt they should, and that lowering your sodium can decrease your risk of hypertension and cardiovascular disease. One source of excessive sodium is processed food. The Center for Science in the Public Interest notes that canned soup is one of the most problematic processed foods when it comes to sodium content. But many people love the convenience, flavor and comfort-food factor of canned soup and are reluctant to give it up for their health. Luckily, there are ways to decrease sodium in canned soup. Dilute canned soup with water. You don't have to obliterate the flavor, but adding even a moderate amount of water to your canned soup can spread out the high sodium content in the soup's subsequent greater volume. You might be surprised how little you notice the flavor change. Try 1/2 cup of extra water to start and adjust up or down to suit your taste. Over time, as you get used to the less-salty flavor, you might find you can add more water without feeling that you are sacrificing flavor. Add extra vegetables, pasta or cubed potatoes to your canned soup. Like adding water, plumping up the volume of canned soup with extra healthy ingredients can reduce the sodium content of each soup serving. Vegetables, whole-wheat pasta and potatoes are naturally low in sodium, and the more you add to high-salt canned soup, the less salty the overall result. 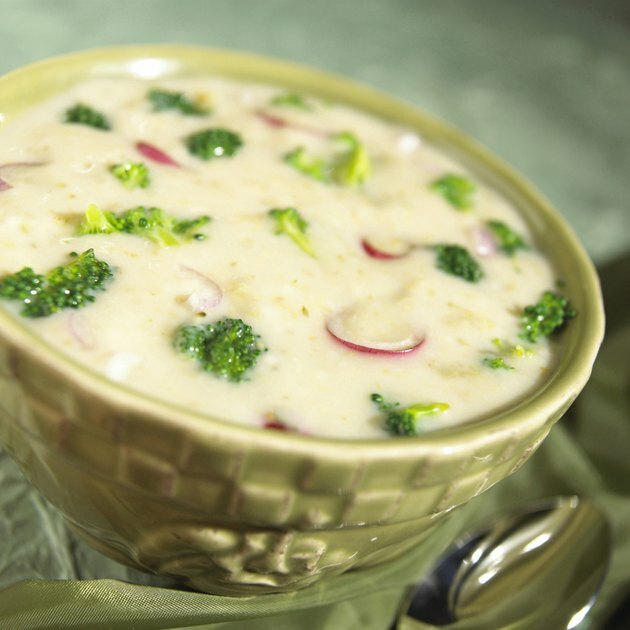 Try lower-sodium canned soup options. Many more low-salt versions of canned soup are available now than in the past, with improved flavor in comparison with previous low-sodium products. Processed foods are virtually always higher in sodium than fresh, whole foods, but lower-sodium canned soups are certainly healthier for your heart and blood pressure than conventional canned soups. Speak to your doctor if you have concerns about your sodium intake and health.